My mother always seemed to do some damage with her teeth when she ate the taffy. While waiting for our ice cream, I noticed a cardboard boat filled with bags of wonderful salt water taffy. Heartfelt memories filled my head of summer fun, the beach and that wonderful candy. Spencer saw me looking at the taffy, asked what it was and stated he had never had any. How could I have not shared this summer fun with the boys after all these years? Dh purchased two bags and on our way home we broke into the candy. First up, peach and it was just as good as I remembered. Then I had to try the juicy pear..mmmm.. The boys both stated how it was a bit sticky but GOOD! Dh ate one piece then asked for a licorice flavored one. Yup, he broke his tooth. 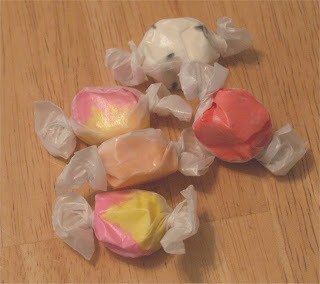 Looks like all my memories were renewed with salt water taffy. lol..